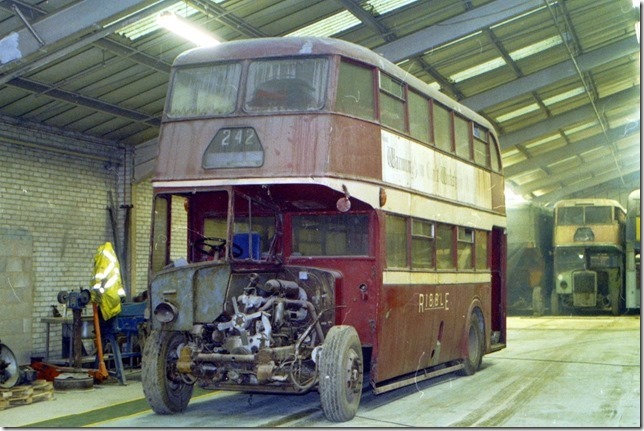 Ribble built up a large fleet of PD2s after the war, seek many of which were fitted with Leyland bodies. 1349 is a low bridge example delivered in 1950 and was one of the batch fitted with platform doors, a first for Ribble on their double deck service buses. The batch were spread widely among Ribble depots and having doors would be suited to longer, inter urban routes. The Leyland body of this era was a refined product utilising polished wood interiors and a well proportioned exterior. They would certainly have enhanced the Ribble image at the time. 1349 was initially allocated to Skerton (Lancaster) depot but it later spent most of its life at Clitheroe. Having been delivered in December 1950 it was withdrawn from Penrith depot in 1965 and sold to dealer Cowley of Salford. It was then purchased by Edwards of Lydbrook in the Forest of Dean who used it on contract and schools work. When advertised for sale in 1973 it was acquired by what was then the newly formed RVPG and was collected from Edwards in August that year and driven to Lancashire. Repainted into Ribble livery it was rallied for several years before being laid up. Following a generous offer of sponsorship for restoration 1349 was moved into a work space in autumn 2014. Since then work has commenced on the bodywork and updates on the work can be found in the blog which is accessed from our home page. It will be some time before it is back on the road but it will be a worthy addition to the ranks of restored Ribble buses.